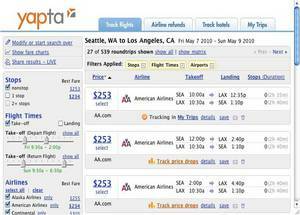 SEATTLE, WA--(Marketwire - February 17, 2010) - Yapta.com, the airfare tracking service, today announced that it has partnered with KAYAK (kayak.com), the largest travel search site in the world, to power its flight search engine. By integrating KAYAK's flight search, which provides prices and itineraries for hundreds of airlines, Yapta is able to provide travelers with a more comprehensive airfare tracking service and an enhanced travel planning experience. "By introducing KAYAK's best-in-class flight search engine, Yapta members now have greater access to flight data and are able to track prices for virtually any flight in the world," said Tom Romary, president and CEO of Yapta. "Tracking airfare prices prior to purchase will help travelers save money 45 percent of the time. And those travelers that continue to track the price of their flight after purchase will find that they're eligible for an airline refund about 15 percent of the time. By combining Yapta's price tracking capability with KAYAK's flight search, we're looking to help even more travelers save on their airfare -- before and after they book." While Yapta has tracked pricing on more than 3 million flights and has identified more than $300 million in savings for its members, it has also provided airline websites with a powerful lift in air bookings by building a stronger tether to potential buyers. According to the travel analyst firm PhoCusWright, the majority of travelers visit between two and five websites when shopping for travel online, and the number one reason for doing this is to compare prices. At the same time, nearly 20 percent of travelers visit six or more sites. By alerting travelers when the price on a specific flight drops, Yapta can direct travelers back to a booking site and improve "look-to-book" ratios by up to 25 percent. "KAYAK and Yapta are similar in that both sites help travelers compare options, and when you find something that fits your budget and tastes, you book it where you want," said Steve Hafner, CEO and co-founder of KAYAK. "In the coming weeks, we'll be looking to pair Yapta's airfare tracking service with the search results on some of our web properties. We're optimistic about airfare price tracking and the impact it can have for both travelers and our business." KAYAK helps people find the best travel choices by comparing hundreds of travel sites at once. The site (kayak.com) provides powerful flight, hotel, car rental, and vacation search, as well as travel search applications for mobile devices. The company has local sites in the US, UK, France, Germany, Italy, India, Spain, and several other countries, and also operates travel search site SideStep and hotel review and information site TravelPost. About this company Yapta, Inc.
Yapta enables travelers to track airfare prices directly from the flight search results powered by KAYAK.